Our fervent prayer for better weather during the month of November was ignominiously ignored by the fates, and we succeeded in beating our October’s all time low of 13 missions by one in November. Yes, the Group flew but 12 Operational Missions during this month. Not our fault of course, but this damned treacherous weather curtailed our activity in the air. Not only that, most of our bombing during the month was through the aid of H2X, GH or PFF methods, which, while effective does not offer one the opportunity to gloat over those excellent strike photos that we used to be able to take on visual runs. Anyhow, we were in there pitching and were always on the alert awaiting the signal to go. Our record for safety was unsurpassed. Not one A/C of this Group was lost to enemy action. 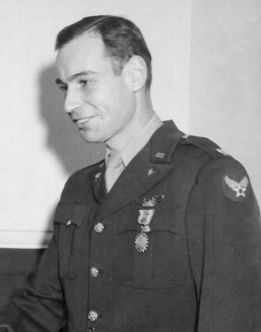 The only A/C and personnel lost was a crack-up on a return from a practice mission when the weather was so poor that we were lucky in getting all the boys except one [2Lt Ralph J. Dooley crew] down for a safe landing on the field. We will go into this crack-up in more detail in the Missing in Action section, right now we will go into the Operational end of our activities. On 2 November we were alerted and given as our target for the day a RR INTERSECTION at BIELEFELD, which is a vital point on the main trunk line from the eastern part of the Ruhr through Hamm, Bielefeld and Minden to Bremen, Hannover, Hamburg and Berlin. So one can easily see the importance of this target. Thirty of our A/C were dispatched under the leadership of MAJOR JAMISON, CAPT’S BOOTH and QUINN. The formation dropped 456x250 GP’s, and 112 M17 incendiaries with the following results: “30 A/C failed to attack Bielefeld due to premature release by lead ship caused by mechanical failure. All A/C from Group dropped on lead ship. SAV show bombs hit canal at 5227-0831.” It happens to the best of them, but even consolated [sic] by this thought it was a bitter pill to swallow. However, hitting the canal more or less compensates for our efforts. On the 4th we were again airborne with 36 A/C under the leadership of LT COL O’NEILL, MAJOR’S BREVAKIS, BETZOLD, and CAPT QUINN, attacking the OIL REFINERY at MISBURG. Another attack on the Hun’s vital oil supplies. A total tonnage of 104 tons of GP’s were dropped through the aid of PFF, but as a result of a few openings in the clouds we discovered that hits were approximately six miles east of the target. Another rough one. KARLSRUHE M/Y was to be our victim on the 5th. Twenty-seven A/C under the leadership of LT COL WILLIAMSON, CAPT’S WRIGHT and SIMES, dropped 86x2000 GP’s on the target with unobserved results as 10/10ths [clouds] forced us to bomb through the aid of H2X. A repeat attack on the MINDEN CANAL was our assignment on 6 Nov. The MPI this time was an aqueduct on the MITTELAND CANAL. Although all traffic is now blocked due to the successful attack on 26 October, the Germans were working feverishly to restore its use and we were going to see that our previous damage remained that way, plus a bit extra today. Twenty-eight of our A/C led by MAJOR BREEDING, CAPT’S QUINN and SPEER dropped 90x2000 GP’s on the target through the aid of PFF with unobserved results. But don’t forget our other attack on this target was by PFF and see the results. The ground forces passed on the information that they were vitally interested in the M/Y in the town of RHEINE, so – what happens? [On November 8th] the 458th contributes her share by placing 23 A/C over the targets led by LT COL HOGG, MAJOR BETZOLD (left) and CAPT SIMES, dropping a total load of 220x500 GP’s on four different targets. The reason for the four, being poor weather and heavy undercast over the target area. All bombing was done through PFF and SAV’s show a majority of bursts on M/Y about 700 yards south of the M.P.I. Six of our A/C attacked NORDHORN on PFF, with bomb strikes shown over IJSSELSCH CANAL ¾ of a mile east of the center of Nordhorn. On the 9th we were called upon by the ground forces to help liquidate ENEMY FORTIFICATIONS about 6 miles SSE of METZ. This was to be an all out effort by the VIII AF as all three divisions were hitting targets in the same or adjacent areas. These fortifications, which were erected in the last World War, were holding up the advance of General Patton’s Third Army, and it was up to the Air Forces to pitch in and give the footsloggers a hand. Although 25 of our A/C were dispatched under the leadership of MAJOR BREEDING, CAPT’S QUINN and CLAGGETT, only 12 attacked the assigned target by GH methods dropping 50x2000 GP’s with unobserved results, however some crews reported hits near the M.P.I. We rather imagine we shall have to wait some time before the results of this attack are officially released, but we do hope our effort this day helped the footsloggers in their advance. The type of target was changed on 10 Nov. First one type is high priority then another, so we were not surprised to have assigned to us an attack on a German airfield, namely the HANAU A/F 3 miles NE of the city of HANAU. This was part of a plan to neutralize important German A/F’s which were being used as bases from which the GAF is operating against our ground forces. Twenty-eight of our A/C led by LT COL WILLIAMSON, LT WAGNER and CAPT SPEER, dropped 1003x100 GP’s on the target by GH method with unobserved results. After a lay off due to poor weather, we were called again on the 16th for another important assignment, another supporting attack in aid of the ground forces. Our target this day was a rough square of land approximately 1400 yards square located 2 miles NNW of the center of ESCHWEILER, 10 miles NE of the center of AACHEN. This area contained gun emplacements in addition to many enemy troops in trenches, and it was our job to clean them out. At take-off time it was rather dubious whether or not we could make it as the weather was extremely poor and not conducive to a good take-off or assembly. But, realizing the importance of the mission, it was decided, weather or no weather we would be airborne. Here is the official weather report on the base: “Base at take-off (1030 hours) sky obscured. Visibility 500 yards in fog.” Under the leadership of COL ISBELL, MAJOR BREEDING, and CAPT’S QUINN and CLAGGETT, thirty-three of our A/C were airborne and all attacked the target, dropping 575x260 [GP’s], and 62 M81 frags with excellent results. A teletype commendation from GENERAL DOOLITTLE states: “The force took off under extremely adverse conditions and successfully attacked targets on the immediate front of our ground troops almost exclusively by instrument technique with very good results. 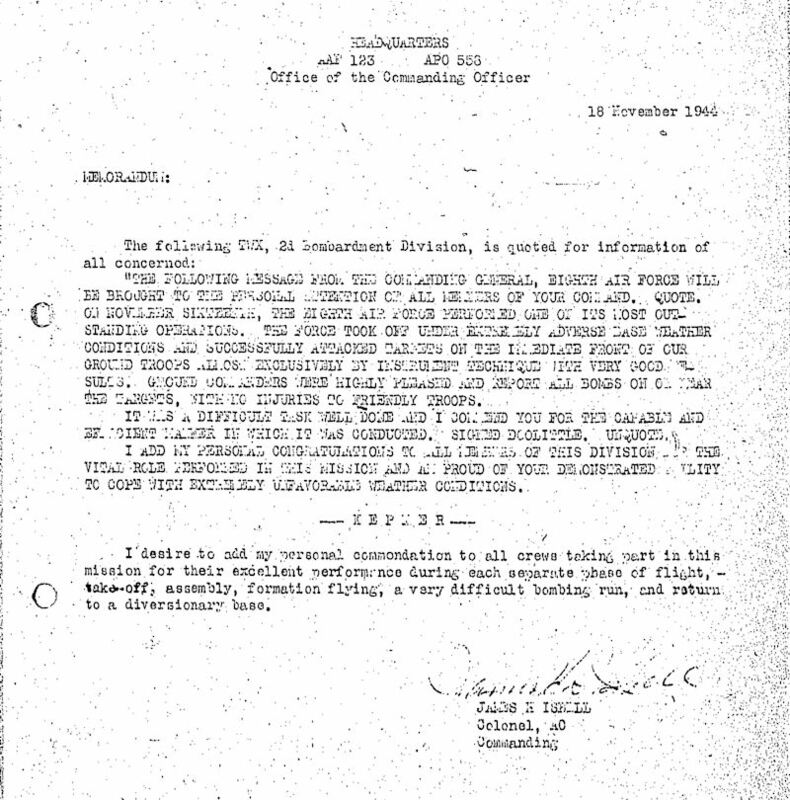 Ground commanders were highly pleased and report all bombs on or near the targets, with no injuries to friendly troops.” (A copy of this commendation, plus one from both the Commanding General of 2BD, and Commanding Officer of this base is appended to this history). Our hats are off to the boys of this group who accomplished what seemed to be the impossible. All A/C were diverted to another base on return due to the still persistent bad weather. Photo Caption: 9th Air Force Martin B-26 Marauders bombed troop positions bordering this military highway near Eschweiler, Germany 11/16/44. Heavy fragmentation bombs, designed to knock out positions without leaving craters that would hamper advancing American troops, are seen bursting around two underpasses of the Autobahn, the double, twin laned military road extending from Aachen to the heart of Germany's industrial section. The photograph was taken after the first formation of Marauders released their bombs. 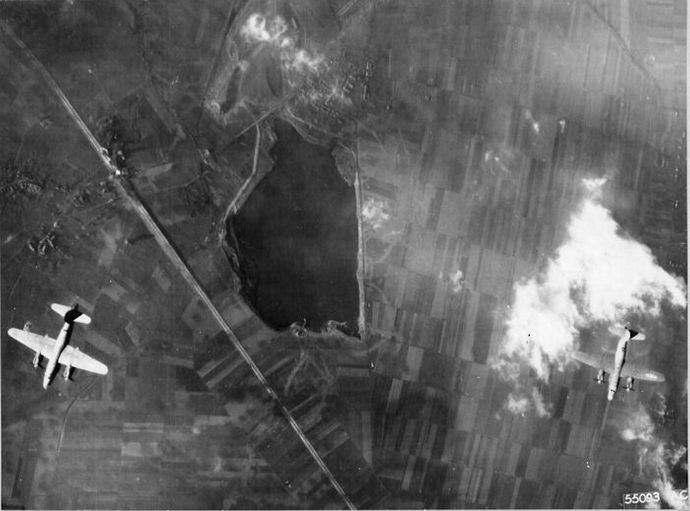 Other waves of medium bombers followed with bombs on troops entrenched around the lake. We were not again airborne until the 21st when 28 of our A/C under the leadership of MAJOR JAMISON, CAPT’S SPEER and QUINN attacked the RHENANIA-OSSAG OIL REFINERY at HARBURG. 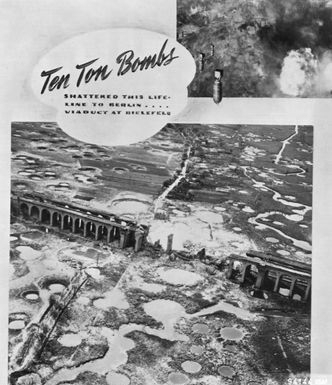 A total of 320x500 GP’s were dropped with the following results: Crews report good pattern and flames in the target area, but SAV’s indicate bomb strikes in outskirts of Harburg, two miles SSE of MPI. Bad weather again kept us on the ground until the 25th when we [attacked] the M/Y at BINGEN on request from SHAEF. Bombing this day was what one would call very poor. Twenty-six of our A/C attacked led by MAJOR HENSLER, MAJOR DARELIUS and CAPT CLAGGETT and dropped 248x500 GP’s and 45 M17’s with the following results: SAV shows bomb pattern to be 2500 to 3000 yards NE of MPI across the Rhine River. The less said about this attack the better. On the 26th we carried the 1000 pounders on our attack on the RR VIADUCT at BIELEFELD (shown at left, after numerous raids). This was our second visit to this high priority target. We placed 32 A/C over the target led by COL ISBELL, MAJOR’S LA ROCHE, HINCKLEY, and CAPT BOOTH. Our total bomb load of 238x1000 GP’s were dropped through the aid of GH equipment with the following results: Incomplete SAV show one possible hit on viaduct by concentrations 900 feet NW and 900 feet SE of MPI. 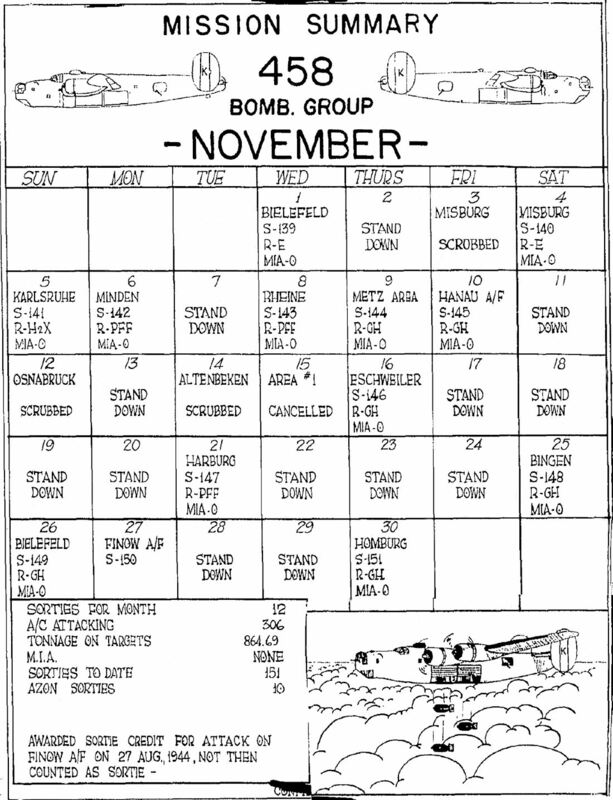 Finally we come to the last mission of November, namely our attack on the M/Y at HOMBURG. This again was complying with the request of SHAEF. We placed 36 A/C over the target under the leadership of LT COL O’NEILL, MAJOR DARELIUS and CAPT’S SPEER, and SIMES. We placed 1569x100 GP’s and incendiaries on the target using GH method with no observed results. And so ends our ninth month of operations against the enemy. How many more???????????? THE FOLLOWING MESSAGE FROM THE COMMANDING GENERAL, EIGHTH AIR FORCE WILL BE BROUGHT TO THE PERSONAL ATTENTION OF ALL MEMBERS OF YOUR COMMAND. QUOTE. 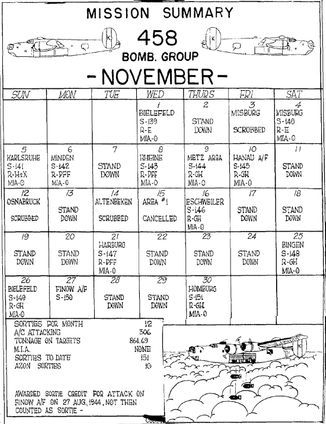 ON NOVEMBER SIXTEENTH, THE EIGHTH AIR FORCE PERFORMED ONE OF ITS MOST OUTSTANDING OPERATIONS. THE FORCE TOOK OFF UNDER EXTREMELY ADVERSE BASE WEATHER CONDITIONS AND SUCCESSFULLY ATTACKED TARGETS ON THE IMMEDIATE FRONT OF OUR GROUND TROOPS ALMOST EXCLUSIVELY BY INSTRUMENT TECHNIQUE WITH VERY GOOD RESULTS. GROUND COMMANDERS WERE HIGHLY PLEASED AND REPORT ALL BOMBS ON OR NEAR THE TARGETS, WITHOUT INJURIES TO FRIENDLY TROOPS. IT WAS A DIFFICULT TASK WELL DONE AND I COMMEND YOU FOR THE CAPABLE AND EFFICIENT MANNER IN WHICH IT WAS CONDUCTED. Signed DOOLITTLE. UNQUOTE. I ADD MY PERSONAL CONGRATULATIONS TO ALL MEMBERS OF THIS DIVISION OF THE VITAL ROLE PERFORMED IN THIS MISSION AND AM PROUD OF YOUR DEMONSTRATED ABILITY TO COPE WITH EXTREMELY UNFAVORABLE WEATHER CONDITIONS. I desire to add my personal commendation to all crews taking part in this mission for their excellent performance during each separate phase of flight – take-off, assembly, formation flying, a very difficult bombing run, and return to a diversionary base.